Restaurant Zayna in Casablanca is one of the most famous restaurants of Morocco. The major aim of the restaurant is to provide high quality food. The restaurant offers a warm and cosy atmosphere. This restaurant is famous for serving some of the best Moroccan dishes along with its unique flavour of cocktails. The restaurant is pocket friendly and the portion served by them satisfies your taste buds. The restaurant also serves the best fish in the locality, always freshly baked. Once you are visiting this restaurant, you should try the desserts. How popular is Restaurant Zayna? People normally club together Foret De Bouskoura and Dream Village while planning their visit to Restaurant Zayna. Pleasant place with good Moroccan vegetarian options. Head here if you're tired of pizza margheritas and want some local chow and culture. Steps from Habbous market for traditional clothes etc. Nice oriental Moroccon restaurant. 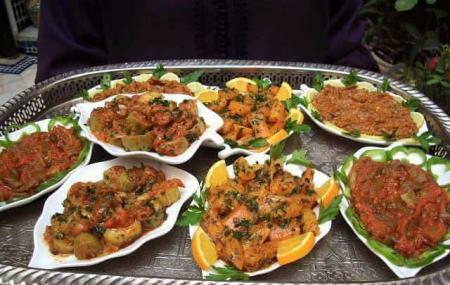 Very good traditional Moroccon food. Really amazing Moroccan food!!!! The Moroccan vegetable soup was amazing and so was their tagines. The owner is the sweetest lady ever....very friendly. A must try in Casablanca. Excellent food This was our introductory meal in Morocco but stayed top of the list even at the end of our tour Tagine and couscous were excellent Mint tea definitely the best ever!